﻿Published by Sareth Ney on Sept. 1, 2016 at 7:30 a.m.
​Updated on Sept. 2, 2016 at 4:14 p.m.
DES MOINES, Iowa – Beast Village Comedy Festival will be taking place at several venues in Des Moines East Village, from Sept. 29 through Oct. 1. It will be headlined by Janelle James and Ian Karmel. 45 comedians from around the U.S. will also perform. Tickets will are available, start at $15 and they can be purchased by clicking here. The House of Bricks was the first venue to welcome comedy, in 2008. In 2010, The Beechwood Lounge followed suit and named their shows “The Bomb Shelter Showcase”. An open mic later opened at the Underground and it was later dubbed Up/Down. During 2014—Beast Village was born, it welcomed local and national comedians. Such as past years—the festival was produced by the community, funded by businesses and showcased the local comedians in the area. James was born in the Caribbean and resides in New York. As a stand-up comedian, she has performed in the following comedy clubs: Caroline’s Comedy Club, Gotham, Helium and The Laugh Factory. She has been on tour with Hannibal Buress, Rob Delaney, Todd Barry and more. Her television credits consist of: “@Midnight” on Comedy Central, “Night Train with Wyatt Cenac” and Fuse’s “Uproarius”. In 2016, she was named as one of the 50 most funny people in the city of Brooklyn, N.Y. Her performances have been noticed by the following publications: Portland Tribune, Time Out Magazine and The New York Times. Karmel was born and raised in Portland, Ore. He received comedic training at The Groundlings and Upright Citizens Brigade. He has performed in the following comedy clubs: Portland’s Helium Comedy Club, Portland’s Helium Comedy Club, Acme Comedy Club in Minneapolis, Austin’s Cap City Comedy Club, Comedy Underground in Seattle and an array of comedy clubs throughout the city of Los Angeles. He showcased his comedic talents at the following festivals: Bridgetown Comedy Festival, Bumbershoot and Moontower Comedy Festival. His television credits included IFC’s “Portlandia” and “Best Sandwich in America” on Travel Channel. He has provided post game analyst and was the commentator for the Portland Trailblazers. Currently—Karmel is a writer on “The Late Late Show with James Corden” and contributes to the Portland Mercury. 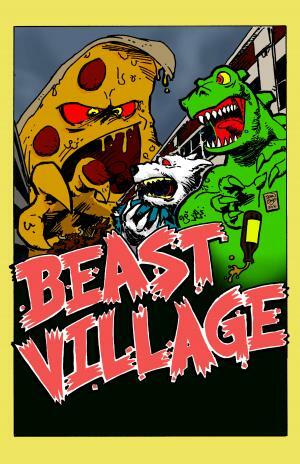 In 2015, local businesses sponsoring Beast Village included: Black Cat Ice Cream, Capes Kafe, Confluence Brewing Company, Des Moines Social Club, DJ Donuts, Felix and Oscar’s, Fugitive Apparel Company, Lefty’s Live Music, Nothing’s Too Weird, Tacopocalypse and Underground Company.